This one looks a little odd in the photo...but its not that odd in person. :-) I had my alternate photographer tonight. I may have mentioned I wear my glasses all day, and change into contacts at home and on the weekends, I thought I would show you my specs. :-) Sorry for the glare, that's why I don't take pics with them. 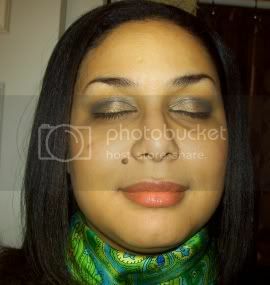 Love the green and blue color combo and that scarf pulls it together so well!! Love it!! love the green on you. Wicked is an awesome production. The music is so great. Great color today! I need a skirt like that, love it! Love the color! and the glasses... I want a pair like that. Cute glasses! I was surprised to hear that you change into contacts when you get home...I'm the opposite! I wear my contacts out during the day, but once I'm at home I take them off and pull out my glasses if I need them. 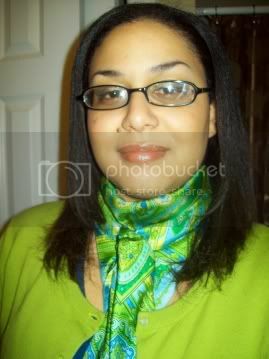 I adore your scarf and how you tied it....you whole look, glasses and all....polished and elegant. Thank you all :-) The scarves are always so much fin to wear. Wicked is one of my favorite show! You'll love it - and you should definitely wear this cardi when you see it! Great color on you! Wicked color for Wicked tickets!! Wicked is one of my favorite musicals. I saw it twice while it was in Chicago. I love the green and blue combo and the printed scaft. The glasses look good on you!